O’Donovan doubted whether she was past her best after losing out at the European Championships. 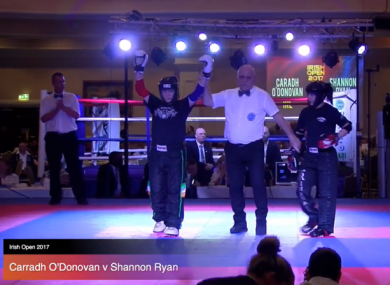 WINNING HER LATEST Irish Open kickboxing title, came at a crucial time for Caradh O’Donovan. It was her fourth consecutive time to triumph in the -55kg point-scoring category, but this was about more than just adding weight to the trophy cabinet. This was about restoring confidence, after a trip to Greece for the WAKO (World Association of Kickboxing Organizations) European Championships ended in misery. “It was a bit of a disaster to be honest,” she tells The42. “I’ve beaten her before and she did go on to win it. It absolutely killed me. I was more upset after all the preparation that I didn’t perform at all. At that level, if you don’t perform you go home. Still unsure as to what happened in Greece, O’Donovan combs through the possible causes of her poor performance. Some of the regular explanations appear in her list. Nerves? Perhaps. Recovery time following a weight-cut? Maybe, although it doesn’t normally affect her until later in the tournament. Elimination at the quarter-final stage meant that this was the first time in five years that O’Donovan didn’t come home with a medal from the European tournament. And although she was happy to stay on and support her teammates, this was all unknown territory for her. Caradh O'Donovan in action at the 2017 Irish Open. She took a break over Christmas to decompress and process the disappointment. Meanwhile, her coach Dave Heffernan preached sensible words about not allowing one bad performance to define her. Gradually, his advice began to resonate with O’Donovan and she was back training by 1 January, with a renewed focus on the Irish Open. Redemption was calling at the Dublin Citywest Convention Centre, where over 4,000 competitors turned up for one of the most respected events in the kickboxing calendar. “It’s always a really prestigious tournament,” O’Donovan explains, “when you have the best fighters from so many different countries. “You don’t just have the number one from those countries, you could have five or six different competitors from different countries. And you have to fight them all in the one day. Addressing those deficiencies in her performance, and clearing the hurdles at the Irish Open, is what has her feeling more optimistic about the competitions that await her for the rest of 2017. The National Championships are first up in April, where a victory is required if she is to secure her spot in the Ireland team travelling to the World Championships later in the year. Additionally, she has World Cup competitions in Hungary, Austria and Italy, all on the horizon. And now she can look to those events with a renewed confidence in her ability. Email “Irish kickboxer Caradh O'Donovan banishes defeat at European championships with Irish Open victory ”. Feedback on “Irish kickboxer Caradh O'Donovan banishes defeat at European championships with Irish Open victory ”.